Canadian composer, violinist, keyboardist and vocalist Owen Pallett is returning to Australia this month. Showcasing tracks from his acclaimed opus In Conflict, Owen Pallett will be treating fans to intimate performances over two nights in Melbourne; at the Toff In Town on Wednesday 18th and Thursday 19th March and in Sydney on Saturday 21 March at Oxford Art Factory Gallery Bar. Tickets to all shows are available NOW. Owen Pallet’s recent album In Conflict comes after several years of collaborative work. Brian Eno sings layered back-up vocals throughout the record, plays synth on The Riverbed and guitar on the title track. In Conflict is full of love songs - more specifically, songs about liminal states and our loved ones locked in battle with them. “The record is meant to approach ‘insanity’ in a positive way,” Owen explains. “Depression, addiction, gender trouble, and the creative state are presented as positive, loveable, empathetic ways of being. Not preferable, per se, but all as equal, valid positions that we experience, which make us human.” As well as being a multi-talented artist in his own right, Owen Pallett has worked with a veritable who’s who of artists writing string, brass and orchestral arrangements for numerous bands including The National, Taylor Swift, R.E.M., Pet Shop Boys, Franz Ferdinand, Duran Duran, Robbie Williams, The Last Shadow Puppets, The Mountain Goats, Beirut, Grizzly Bear, Linkin Park, Snow Patrol and Arcade Fire. Adding to this impressive list Owen continues to be a touring member of Arcade Fire on synths and viola and received an Emmy for his soundtrack to the New York Times Magazine-sponsored Fourteen Actors Acting project, as well as an Oscar-nomination for his work on Spike Jonze’s Her. Utilising instruments, loops and skilfully layering his lush soundscapes, Owen Pallett virtually transforms into a one man orchestra to turn his densely polyphonic pop treasures into an intensely compelling live show. 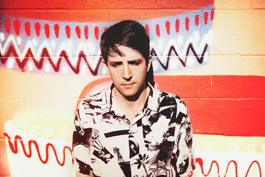 Don’t miss your chance to see Owen Pallett live in Sydney and Melbourne!